Kristen has been playing piano since the tender age of six. After receiving classical training for 12 years, Kristen then went on to explore her passion for jazz, soul & pop music and has never looked back. It was during this period that she began writing her own material & singing became a natural result of her desire to communicate with her audience. 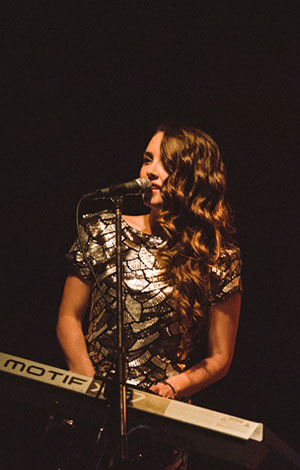 Now, Kristen performs as both a keyboardist & singer, having shared the stage with some of Australia’s finest including Dami Im, Samantha Jade, Bertie Blackman, Urthboy and recently International pop star Hilary Duff. Fronting her own trio, Kristen brings together all her influences to create a new & refreshing sound. The trio has been working around Sydney performing Kristen's unique versions of current pop tunes & soulful classics. Her performances are something to be experienced – an exciting, largely improvised concoction of great songs! The past two years have been exciting for Kristen & her trio, with the recording & release of their debut originals album and a tour to the Philippines under their belt. Her influences stem from a wide musical palette, including the likes of Stevie Wonder, Chick Corea, Robert Glasper and electro-pop duo, Bird & the Bee.